Star Wars: The Clone Wars has certainly been a major point in the lives of Star Wars fans everywhere over the past five years, so when news broke that the show would not be renewed for a 6th season, obviously fans were heartbroken-especially since the season was already halfway done with production. Since this news, Lucasfilm has come out and said that they would release these finished episodes in a "half-season" called "The Lost Missions". 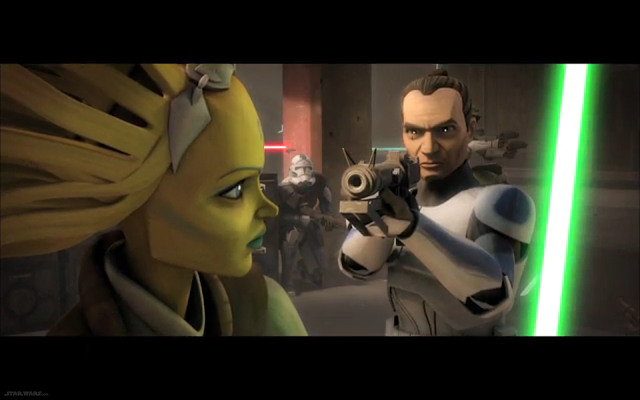 Check out Supervising Director Dave Filoni discussing the future for Star Wars: The Clone Wars. How and when the episodes will be distributed has not been determined-until now. JediNews has recently reported that the German channel "SuperRTL" will be premiering the episodes on Saturday, February 15th, showing one of the four story arcs every Saturday. Below is a rough translated copy of the RTL press release. The captivating series offshoot of George Lucas' Star Wars universe plays between the movies "Star Wars: Episode II- Attack of the Clones" and "Star Wars: Episode III- Revenge of the Sith". It tells the story of the epic Clone Wars, which is illuminated in all its facets. The Jedi Order is desperately trying to defeat the Separatists under the cunning Dooku, to save the Galactic Republic. But Anakin Skywalker, Obi-Wan Kenobi and Ahsoka Tano are often outnumbered, as the droid armies of the Separatists are cheap to replace and easy. Only through courage, cohesion and igenuity, it can manage to end the war and to bring lasting peace to the galaxy. Master Yoda for a special mission to fulfill, as a devious enemy from the past could soon have a mystical weapon with tremendous strength. To prevent this must be fellow Jedi to reveal the secret of his hidden enemy. ClubJade has gone ahead and provided a translation of the German episode names and plot synopsis. Other episode titles include: The Disappeared (Part 2,) The Lost One, Voices, Destiny and Sacrifice. Of these 12 episodes, it appears we are getting the much-talked about "Order 66" story arc, the Rush Clovis arc that was moved from Season Five, and the final episodes with no description can only be assumed to be the "Yoda" arc, the "Plo Koon/Sifo Dyas" arc. Considering Germany is getting these episodes in a mere month, it can't be long before the rest of the world follows behind. We should expect to hear official news regarding worldwide release in the near future.